PRICE REDUCED - 4BR Brick Home on Washington St. 4BR, 2.5BA Brick Ranch on .77 Acre Lot Near Downtown Barnwell Neat 4BR, 2.5BA brick ranch near downtown Barnwell has spacious living room,dining room, large family room opening to a convenient kitchen. Living Room and family room each have a fireplace. 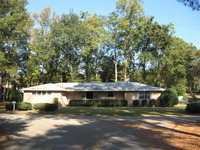 Has separate utility/office and 2-car garage. Includes appliances. Also has a beautiful backyard. Call Sally Smith 803-591-9274 to make an appointment.